Rooted in creativity, bravado, and rich musical chemistry, The Commodores song “Brick House” remains a classic. It raises vibration and positively affirms the strength, beauty, and mightiness of black women. Though it was released in 1977 as a single on The Commodores self-titled album, 41 years later artist Simone Leigh remains inspired by the song’s lyrics. 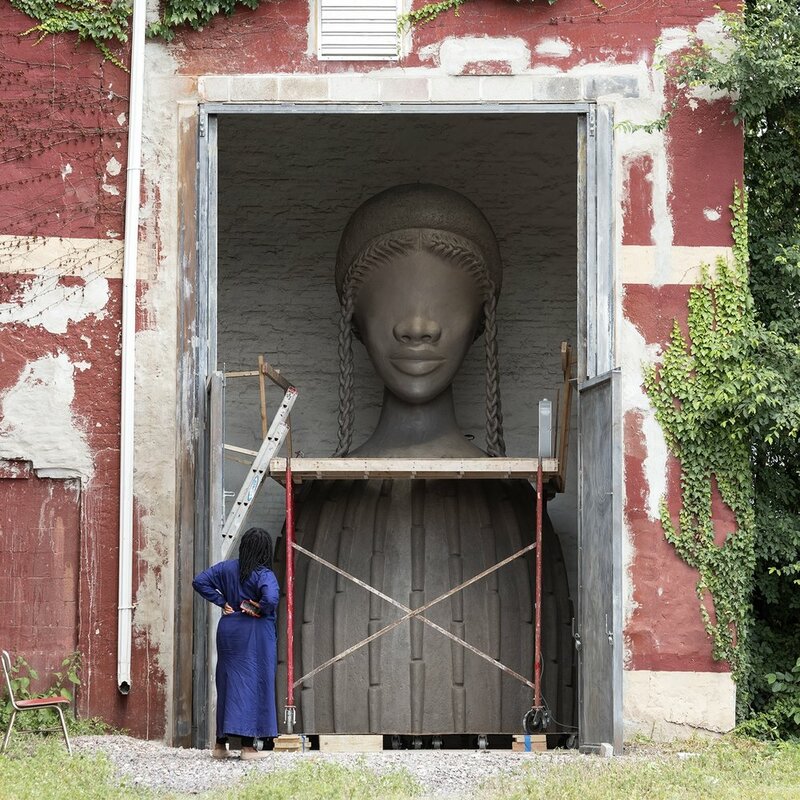 Leigh’s 16-foot bronze sculpture Brick House was recently selected as the inaugural winner of New York City’s High Line Project—a new series of large-scale commissions to be installed on the High Line beginning April 2019. Tying in elements from her childhood, Leigh credits Good Times TV show character Thelma as a source of inspiration for her sculpture. In a recent conversation with the New York Times, Leigh describes Thelma as “one of the earliest representations of black women I knew,” noting her cornrow hairstyle as an influence behind her sculpture’s hair. Aside from aesthetic qualities, cornrows carry deep historical meaning within African culture. Atlanta based cosmetologist, barber, and author Toni Love recently spoke to Essence magazine about the importance of cornrows and their sacredness within black communities. “History tells us cornrows originated in Africa. The intricate braiding of the hair indicated the tribe you belonged to. Cornrows on women date back to at least 3000 B.C. and as far back as the nineteenth century for men, particularly in Ethiopia. Warriors and kings were identified by their braided hairstyles.” Cornrows also indicate a person’s age, religious beliefs, kinship, marital status, and wealth, and were even a means to attain freedom during slavery. These varied examples illustrate the functionality of cornrows within black communities and affirm Leigh’s decision to feature the hairstyle in Brick House as a reinscription of meanings central to people of African descent. For her sculpture’s torso, Leigh selects a distinct cultural artifact known as the teleuk (singular) or telekakays (plural). Teleukakays are homes inhabited and crafted by Mousgoum people of northern Chad and Cameroon. Though there are few resources dedicated to the study of Mousgoum history and culture, art historian and UCLA professor Steven Nelson details their architectural history in his book From Cameroon to Paris: Mousgoum Architecture In and Out of Africa. Originally based in the Sudanic-Sahel climatic region, Mousgoum people lived between the central African nation-states of Cameroon and Chad. Nelson cites their origins in this region as early as the 16th and 17th centuries, with a history shaped by bloody raids, wars, and European subjugation. “Most histories of the Mousgoum emphasize the interweaving of migration and warfare.” German, French, and Islamic kingdom leaders actively raided their communities and sparked the eventual migration of Mousgoum people into the northern parts of Chad and Cameroon. The teleuk communicates a solid, anchored presence as “the preeminent sign of their culture, one that triggers memories of a Mousgoum past and symbolizes Mousgoum cultural survival in an ever-changing world,” according to Nelson. The construction of teleukakays also allude to gender dynamics and cultural norms. Masonry is typically undertaken by male members of the community and reveals their ability to provide a physically sound housing structure for their families. The woman’s role of decorating and embellishing the teleuk showcases her understanding of physical beauty—a characteristic essential to any respectable woman in Mousgoum society. Both skills illustrate important elements of Mousgoum culture, demonstrating the centrality of the teleuk to Mousgoum identity and family life. Simone Leigh’s recreation of the teleuk transcends centuries of attempts to erase Mousgoum identity due to racism, colonialism, and war. She shifts conversation around teleukakays by critiquing the racist mythology surrounding African dwellings. She describes teleukakays as “really quite beautiful and sophisticated objects,” and her understanding of such beauty breathes life into the sculpture. Given the history of enslaved African men and women in America, Leigh’s Brick House subverts narratives surrounding European-American architecture as superior to African design. The mere presence of Brick House on the High Line reminds us of the importance of African art and invites viewers to engage with African architecture on a grand scale. As a fusion of historically suppressed African architectural practices and a great African American hit song, Brick House stands as a powerful reminder to appreciate African art and intellectual thought. In one of her comments to the New York Times, Ms. Leigh shares how she thought the High Line Project would offer “a great opportunity to have something about black beauty right in the middle of that environment.” To her extend her point, Brick House has the power to beautify the High Line, stand as a physical memory of African art history, and depicts the multifaceted nature of black women upon its installation April 2019 through September 2020. For more information regarding the High Line Project, Simone Leigh, Mousgoum culture, and Brick House, check out the resources listed below and stay current with African American art news @blackartinamerica.